Apologies if this makes me a bad parent, but I’m not actually sure how much sugar my kids eat each day. I do know that it makes them very excited to do so, and so every possible spike in sucrose and fructose in their daily routine is something to be negotiated, connived or at least celebrated. In the case of my four- and eight-year-old, a lot of this love for sweets is probably tied to their ages— kids taste receptors don’t work the same way adults’ do, and their growth seems to help them use those calories too. If these preferences last past their 16th birthdays though, their mom and I may be to blame, not because of parenting, but because of genetics. Danish researchers recently isolated what they believe to be a “sweet tooth” gene, FGF21. Two variations in this gene was associated with significantly higher amounts of sugar consumption on a daily basis among the 6,500 people who participated in the study. The more common variations of the gene help produce hormones that calm neurological reward responses, making sugar less exciting to our brains after a certain amount has been eaten. People with this genetic sweet tooth don’t seem to have that same cap, and happily consume more sugar without feeling sated by it. More troubling, there may this reward connection may mean these people are also more likely to consume more alcohol and cigarettes, although that hasn’t been explicitly proven yet. Before you start blaming FGF21 for the last candy bar you ate, don’t forget the other sweet tooth gene, SLCa2. Identified in 2008, this gene produces a protein called GLUT2, which helps move glucose around the body and help us feel full after our blood sugar levels are normalized. In lab experiments, mice with a mutation on the FGF21 gene were prone to eating more food than other mice, and there may be a correlation with Type 2 Diabetes. Overall, a change in a single amino acid correlated with as much as 25 more grams of sugar than people without the sweet tooth mutation. Importantly, neither sweet tooth gene mutation really synced up with serious health problems (although these test participants’ dentists may have a different opinion on that.) People with FGF21 mutations actually had lower body mass indexes on average, so if they were somehow eating more calories due to extra sugar, they were also making up for it elsewhere in their diets. People with SLCa2 mutations were similar— while they may have eaten anywhere from 3 to 15 additional grams of sugar than other people, they weren’t consuming extra calories as a result. They were just making sugar a bigger proportion of their diet. This may be problematic if the remaining calories aren’t providing enough vitamins, antioxidants and fiber, but by itself a sweet tooth isn’t necessarily a bad thing. 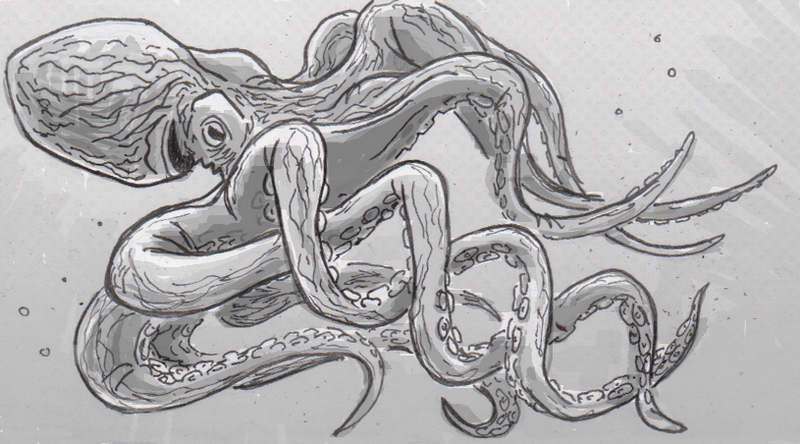 Cephalopods are part of an ancient lineage, with some of the family tree predating the dinosaurs. A subset of these animals known as coleoids, which includes octopuses, squid and cuttlefish, stand out from the group, which is hard to do in a family of boneless, tentacled, color-changing weirdos. What makes these particular sea creatures so unusual is their unusually-developed brains, the biggest of any invertebrate. It hasn’t been definitively linked, but new analysis of coleoid genomes suggests that big brains are the result of some very unusual genetic activity taking place on an unprecedented scale. Octopuses, squid and cuttlefish somehow didn’t find this system sufficient, and have shifted a lot of weight onto the “working copy” of their body plans. Instead of the small edit or transcription error here or there, usually not accounting for more than one percent of the overall genome, brainy coleoids change at lot as their RNA transcribes information from their DNA. Researchers found as many as 130,000 edited RNA sites, most of which concerned the construction of the animals’ nervous systems and brains. Instead of having the DNA carry the plans for advanced neurological functions, those instructions seem to only exist temporarily when the RNA goes to work. The one big exception to this coleoid editing process is the shelled nautilus, although just as they skip these RNA-upgrades, they’re also considered to be the dimmest bulb of the bunch, so the correlation holds. It would seem like keeping some of these neat upgrades outside of your permanent DNA archive would have some drawbacks. Most animals do fine without these last-minute edits to their genome, so the extra complication might come with a price. As far as researchers can tell, the trade-off is that these species’ DNA has had to dedicate a lot of space to preserve the sections of data that need special RNA editing. As a result of this packaging, the amount of genetically-inheritable adaptations has been slightly diminished, which means that evolutionary change has been very slow-going. The upside of this system is that even if each possibly beneficial mutation can’t easily be passed on to the next generation in more inert DNA, the last-second edits to RNA can be very responsive to the needs of each individual octopus or squid. It may allow for more flexibility with environmental changes, or even be a way to encode experiences and memory without a big cerebellum to put them in. 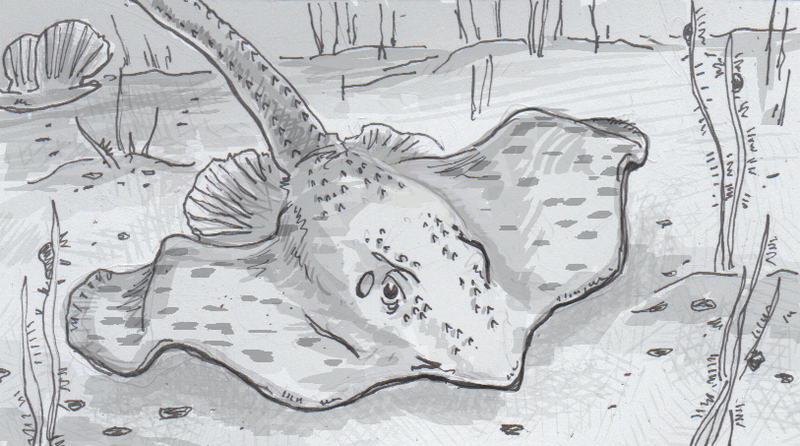 Rays, skates and sharks have a sense that our ancestors gave up (mostly). These cartilaginous fish generally don’t have great eyesight, but they can make up for it by sensing electric activity in their prey. This ability, known as electrosensory, allows something like a little skate (Leucoraja erinacea) to detect prey buried under a layer of sand, picking up the electrical activity of the animal’s heart beat. The basics of this ability have been known for some time, but researchers now say they’ve figured out the underlying biology that makes it all possible. To try to trace each step of some skates’ electrosensitivity, researchers modified skate’s genomes to isolate different genes that were thought to play a role in the electrosensory organs. Bit by bit, they put together how electrical activity in prey can somehow be detected and transmitted to the skate’s brain. The process starts with voltage-sensitive calcium in specialized cells, which draws in calcium ions when activated. To boost that signal, the calcium ions also trigger potassium in the cell, which causes an oscillation in the surrounding electrical field. This helps get even a faint amount of electricity up to a threshold that will trigger a nerve signal to the skate’s brain. This bit of biochemistry may seem quite esoteric, but it has connections to our own anatomy. The genes involved in detecting electric perturbations were found to be connected to the genes that our bodies use to build our ears’ sensitivity to sound. Long ago, many organisms probably relied on electrosensitivity to find prey, particularly considering the how well electricity conducts in water. Sharks, rays and skates held onto this ability, but other fish repurposed some of these sensors into a structure called a lateral line, which lets them detect movement in the water around them. Eventually, those genes were modified further, and now play a role in how we detect sound. In the lab, researchers were able to make similar modifications to ion channels on rat cells (not rats) that they carried out on the skates. This similarity helps support the idea of a common point of origin, and may allow for new avenues for research. It’s possible that insight gained from skates’ and sharks’ electrosensitivity will help inform us about how our inner ears send signals to our brains. This is a story about chromosomes, misidentified butterflies, and conflicting evidence, complete with a missing person. It’s also a story where the details simultaneously count, but kind of don’t, at least from the larger perspective of illustrating how science works. The whole thing lacks a romantic interest, but that might get worked out soon if there’s enough sexual dimorphism between the butterflies. For 40 years, scientific literature has been in agreement that monarch butterflies (Danaus plexippus) have 30 chromosomes— the packets of DNA that are shared and resorted during fertilization, but are also used when a cell divides itself. Counting the number of chromosomes has been a fairly stable concept, and so if a study from 1975 reported that these butterflies have 30 chromosomes, there hasn’t been a lot of reason for doubt. As such, other studies have relied on that figure, citing it as a reference point over and over. However, one of the strengths of the scientific method is that ideas can be challenged, if you have evidence to do so. 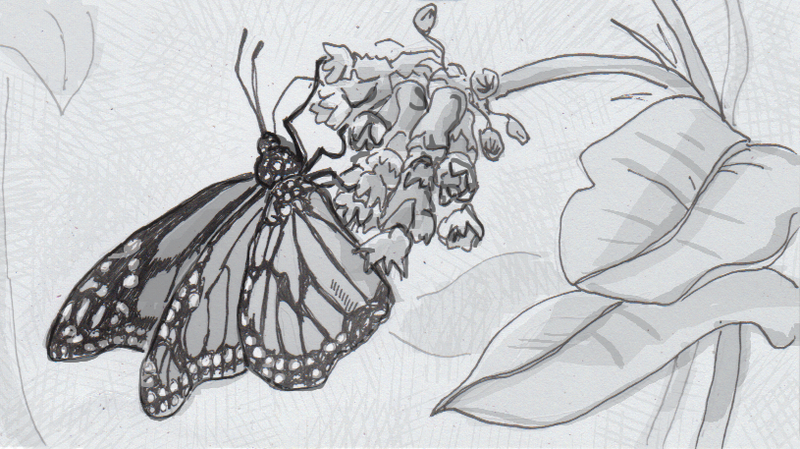 In the case of the monarchs, a postdoc noted that his own observations didn’t match up with the established chromosome count, and so he started investigating why that might be true. One of the immediate questions that came up was that the 1975 paper was conducted in India, a country that is not on any of the standard migration routes for monarch butterflies native to the Americas. This bit of geography was especially reverent when considering taxonomic confusion already surrounding monarchs. Many other species benefit from mimicking the bright orange markings of monarchs, because they signal to birds that they may be poisonous and not worth eating. These similarities have apparently been good enough to also confuse humans, with many scientists struggling to definitively classify monarchs and their relatives for over 100 years. In this case, monarchs and tiger butterflies (Danaus genutia) were only officially designated separate species in 1954. Without today’s instantaneous exchanges of information (#monarchsplit?#butterflygate? ), it’s easy to see how the 1975 chromosome count may have accidentally been conducted on tiger butterflies, which do live in India. Unfortunately, the original authors of that study aren’t available to answer these questions. Fortunately, science can dig into the question anyway by looking for more evidence in the form of butterfly DNA. Six young, verified monarchs have since been found to have 28 chromosomes, which seems like it should settle the debate, but things get better. A second paper has recently been published asserting 30 chromosomes again, which is where scientific investigation may really have a chance to shine. While the confusing history of monarch identification might have created a bit of intrigue, new, conflicting results might point to new, larger scientific questions about these butterflies’ genetics. Butterflies in the same genus as monarchs have been known to have some unusual variability in their chromosomes, so all this investigation may lead to a more profound understanding of these insects, well beyond a single figure in an old publication. My four-year-old then said: Maybe that’s because one is a boy and one is a girl? Tiger butterflies do generally have more white on their wings, but that wouldn’t really be confused with the differences between male and female monarchs. Male monarchs can be identified by claspers on their abdomens, to small black spots along the dark veins of their hind-wings, and thinner black veins in their wing markings overall. Both males and female do have some white spots, but not the in the concentration you find on a tiger butterfly’s wings. Milk is a substance that has, for millions of years, been made exclusively by mammals. Most species use the mix of water, proteins, minerals and sugar to feed their babies exclusively, but humans have have decided that it’s worth consuming dairy throughout our lives, even if we get it from other animals like cows and goats. With demand growing for dairy, but livestock requiring a lot of resources and space to raise, new sources of milk are being developed, even from well outside the animal kingdom. The newest form of milk should look a lot like what we’re used to getting from cows, but it will largely be sourced from yeasts. This isn’t to say that we’ll be directly milking yeasts, but that the yeasts will grow many of the crucial proteins, like casein, normally produced by cows. Researchers were able to isolate which genes are responsible for these proteins in the cows, and then inserted those genes into the yeast’s relatively simple genome. With yeast producing these proteins, many of the other ingredients in bovine milk can also be sourced without actual cows. There are some things beyond the reach of yeast though, such as sugars like lactose (or some equivalent) and immunoglobins that help protect against bacteria like E. coli and Helicobacter pylori. Yeast-sourced milk isn’t the first cowless milk option, but it’s the closest you’ll find to the real thing. Soy and rice milks have been fairly decent analogs to bovine milk for a while, but yeast will offer something much closer to a mammalian food-source without involving too many large, resource-heavy mammals (unless you count the humans involved…) It will be a while before it can compete with the price of milk from cows, but as people become more sensitive to how much it costs the world to raise even a single cow, this might seem like a very efficient option. Not to undersell the gravitas of a 500-pound anaconda, but most people’s initial image of a ‘scary snake’ involves a view of some very specialized fangs. We’re not wrong to be concerned with the fangs of cobras and vipers, since these highly evolved teeth can pierce and deliver potentially fatal venom with an impressive degree of efficiency. Of course, any threat severe enough to have possibly influenced the evolution of other animals didn’t happen easily, and in the case of venomous snakes seems to have involved two major milestones: moving venom-delivering teeth to the front of the mouth, then transforming those teeth into tubes. It’s forgivable if you’ve never noticed how many teeth the average snake has, especially if you’re distracted by bigger fangs right up front. Those fangs, as venom-delivery devices, were once located in the back of the a snake’s mouth, closer to where the venom producing glands are located. Some snakes, like the boomslang (Dispholidus typus), still carry their relatively inefficient fangs at the back of their mouth, meaning they have to open their jaws as wide as possible before gnashing on their prey to deliver otherwise potent venom. It can work, but around 60 million years ago, the shared ancestor of vipers and cobras made a pretty big improvement on this arrangement. Looking at developing snake embryos, researchers noticed that fangs first develop at the back of the mouth in every species. However, cobras and vipers then have a second key stage thanks to mutations on the Sonic hedgehog gene, where the fangs basically become uncoupled from the other teeth, migrating to the front of the mouth. This is partially thanks to that section of the jaw growing faster in these snakes, “moving” anatomy around relative to other parts of the mouth. It was apparently a successful enough shift to warrant dropping other structures, mainly the front row of teeth that used to occupy that part of the mouth. This was only one part of snakes’ predatory prowess though, since the original, primitive fangs weren’t the venom syringe we see in modern animals. Fossils have proven that snakes had modern, tube-shaped fangs by the Miocene period, between five to twenty million years ago, but things are a little murkier before that. There isn’t a lot of evidence about the development of enclosed teeth, but we do know that snakes and other reptiles were toting venom in their mouths as far back as the Triassic period, around 200 million years ago. Uatchitodon was a genus of carnivorous reptiles known only from their teeth, but their teeth tell us a lot. An older species, Uatchitodon kroehleri, likely delivered venom with grooved teeth, like a modern gila monster (Heloderma suspectum). Rather than piercing and injecting venom, these teeth require a bit more mashing to deliver the toxin to its target. 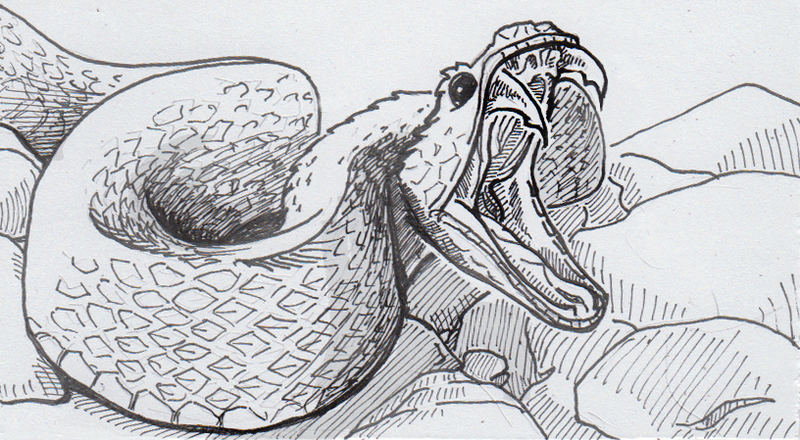 A later species, Uatchitodon schneideri, known only from one tooth, seems to have made the leap to tubular teeth though, possibly providing this evolutionary upgrade to snakes before they moved their fangs to the front of their mouth. Without more fossilized snake fangs, it’s hard to say for sure, but looking at the growth of replacement fangs, there is a developmental stage where fangs grow first with grooves, then cover seal those grooves up to make venom-delivering tubes. This developmental sequence makes sense, because a groove could still carry toxins well enough. The evolutionary progression of these teeth makes it clear that snakes haven’t been willing to settle for good enough though, pushing these two teeth as dangerous as possible. Securing sources of spider venom, without the spider! We’ve all been there— you’re trying to acquire a decent amount of spider venom, but just can’t stand all that creepy, erratic wriggling from the spiders. Not to mention the sticky, inconvenient webs and annoying habit of hiding in tiny nooks and crannies everywhere. Well, squirm no more, because it turns out there are alternative sources for a good spider venom proteins that won’t trigger the ole’ arachnophobia! 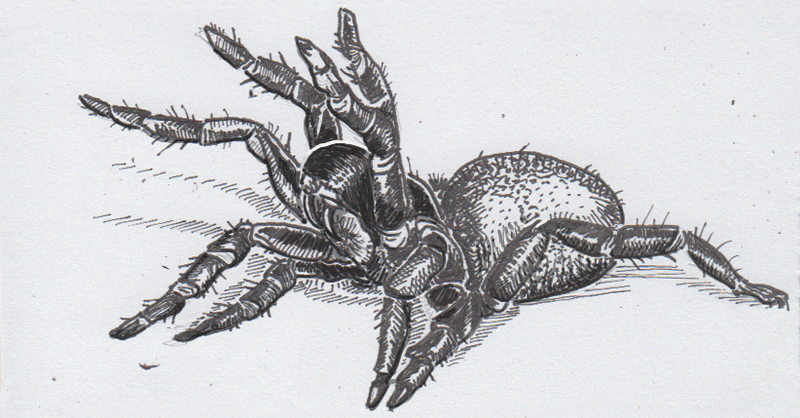 All you need is some genetically modified yeasts, or a virus infecting a bacteria infecting an insect…or spider. At this point you’re probably thinking “why would I need more spider venom in my life?” Because you want to do what spiders can do! No, not the “walking on the ceiling thing,” the “killing loads of insects” thing! Spider venom proteins can be used to make effective but safe insecticides, because spiders have been killing insects for 350 million years! But unlike conventional insecticides, venom-based alternatives don’t linger as long in the environment, meaning less clean-up for you! They can also be carefully tailored for different targets, meaning you can keep your favorite bugs, like bees, safe and sound. If wiping out insects wasn’t enough, there’s also the promise of treating some forms of epilepsy or strokes! “Wow!” you’re saying, “These spider venom proteins are great! But milking venom from spider fangs is a pain! And I still hate all those wriggling legs!” This is where yeasts come in— once a venom has been sampled the old-fashioned way, genetically modified yeast can build the key proteins for you, in much larger quantities. They can also produce other spider-sourced products, like the amazing silk known for its incredible relative strength and flexibility. If a yeast isn’t up to the task, bacteria may be able to take over and crank out venom proteins. Now if you’re concerned about genetic modification, you’re a little behind the times, but you’ve still got options that don’t require eight twitching legs in your face! It turns out a virus called WO that infects the bacteria Wolbachia has started sourcing spider venom proteins ages ago! The virus needed a way to break through animal cells to reach the Wolbachia bacteria. Wolbachia infects arthropods from insects to nematodes to, yes, spiders, and so at some point the WO virus picked up a little help from black widows (Latrodectus hesperus). By borrowing some DNA from the spiders (hey, it’s a natural GMO…), the virus is now able to produce the same proteins the black widow spiders rely on shred through the cells of their prey. It’s the same venom proteins the pros use, but without the spider! At this point we don’t have much control over WO or how it acquired the DNA necessary to produce these proteins, but manipulating viruses the bacteria they may infect is a definite point of interest. It may be another form of pest control that would work from the inside out. It’s definitely not available in stores, but researchers are still standing by to try to harness the potential. 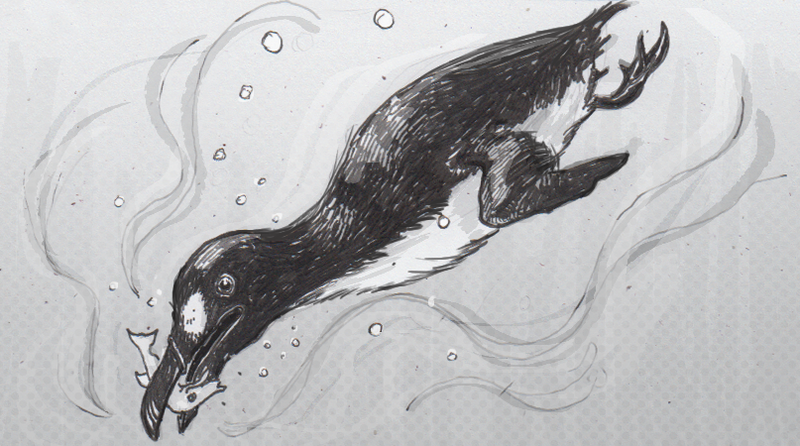 Great auks were flightless, seafaring birds that once lived along the coasts of the north Atlantic ocean. They could be said to resemble a puffin mixed with a puffin, perhaps, but a conservation group called Revive & Restore is most interested in how closely they resemble a razorbill. This might seem odd, as the 33-inch-tall auks were so much bigger than the eight-inch-tall razorbills that you wouldn’t mistake the two animals, but the key similarities are in the two species DNA. Razorbills (Alca torda) are great auks (Pinguinus impennis) closest living relative, and thus the most logical starting point to genetically engineer a new version of the now extinct seabirds. Taxidermied great auks have been persevered in museums, but no birds have been seen alive since 1852. Their extinction is predominantly thanks to humans, who hunted them for their feathers, meat, fat and oil. They used to live on both sides of the Atlantic, and as a one of the larger seabirds in that ecosystem, it’s now being debated if we should try to restore them to this niche somehow. Of course, other birds have since made use of their old nesting grounds by now, but as a larger predator they would have held an ecological role that wouldn’t be easily replaced. With that motivation in mind, Revive & Restore is looking to bring the great auks back from extinction. To be more specific, they’re proposing to replace them with morphologically similar birds created through manipulating razorbill genes to be more like their extinct relatives. These new auk-like birds would theoretically function in the local ecology like their relatives once did, increasing the local biodiversity and helping humans feel like we were able to help a species, instead of repeatedly driving them towards extinction. It would also help us improve the methodology behind this concept, possibly paving the way for the de-extinction of other animals like passenger pigeons or even woolly mammoths. There are concerns with this plan though. While some techniques pushed by Revive & Restore have been helpful in pushing black-footed ferrets back from a genetic cul-de-sac as their populations dwindled to near extinction, those animals had never completely been lost, and thus didn’t need to be reengineered as much as an extinct species like the great auk would require. There are also concerns on a conceptual level, with some people worrying that humans will value current ecosystems even less if they’re perceived as easily replaceable. Beyond that, there is debate over if this is the best use of limited resources, and that we should instead focus on preserving the current run of many species, rather than trying to patch things up later on. Sadly, many species seem to be getting close to needing some form of intervention sooner than later, meaning we may need every possible option on the table in order to salvage our ecosystems. Evolution is a slow, incremental process that takes place over generations. Small changes in individuals’ genes might make improvements in their life and reproductive chances, possibly being passed down to their offspring for further advantage. Most of the time, these changes are too small and gradual for us to notice, only proving their value over generations. Unless there’s no time for all that, in which case things can change in a hurry. Mirrored carp (Cyprinus carpio) are the product of human intervention, rather than natural selection. They’re noted for their patches of shiny scales, but also for how few scales they have on their bodies. This is because European monks found some carp with a mutation that caused them to grow fewer scales, which made the fish more convenient to prepare for dinner. 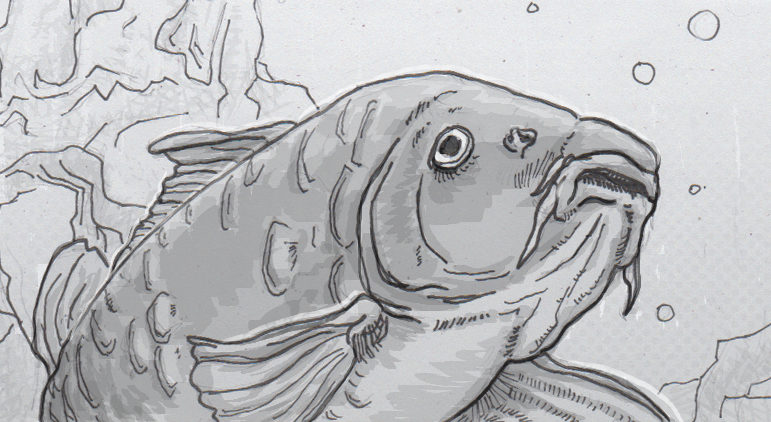 After selectively breeding these carp, the mutation became common enough to more or less sustain itself. However, once some mirrored carp where released in Madagascar in the 1912, that mutation was no longer providing any advantage to the fish. Without monks overseeing their breeding, lacking scales seemed to be a problem, as the fish were found to be growing scales more densely again by the 1950s. Importantly, the new scales weren’t due to a strict reversal of human breeding, but actually a new genetic mechanism to grow more scales. A different gene had mutated along the way, and within just a few decades proven to be useful enough to begin dominating the gene pool. Tasmanian devils (Sarcophilus harrisii) seem to be in the midst of updating their genes right now, and without a moment to spare. The small, carnivorous marsupials are dealing with an outbreak of contagious cancer. The disease is transmitted through saliva when the animals fight and bite each other, and their meager population has been considered at great risk of extinction as a result. However, around ten percent of the exposed animals don’t succumb to the disease, and two specific genes seem to be the keys to their success. What’s more, widespread genetic tests indicate that those genes are being quickly propagated through the Tasmanian devil population. Combined with other, more traditional conservation efforts, these changes in the species genome may just arrive fast enough to save them from disaster. While paleontologists have found mummified dinosaur skin, fossilized stomach contents and even traces of dinosaur blood vessels, we don’t have any useful eyeballs. Fortunately, this doesn’t mean that understanding dinosaur vision is a total blind spot (ahem). Between eye socket placement, specialized brain structures and surviving relatives, we have a few hypothesis about how extinct dinosaurs saw the world. For instance, by looking at living animals like birds and turtles, scientists now think that dinosaurs had very good color vision, with better acuity than our own, particularly with anything that was red. The eyeballs that were examined were from members of the clade archosauria. This group includes crocodiles, turtles, birds, and dinosaurs, but not earlier reptiles like lizards and snakes. Since turtles and crocodiles predate both dinosaurs and living birds, any genetics shared between the shelled reptiles and modern avians would have had to been passed down through extinct dinosaurs. As it happens, a gene called CYP2J19 fits the bill, as it allows both turtles and birds to see red, and thus probably did the same for every Brachiosaurus and Triceratops as too. 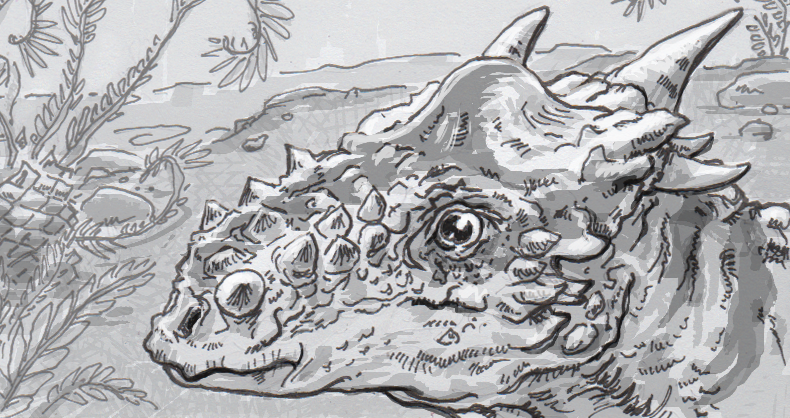 CYP2J19’s influence on archosaur vision isn’t a straight-forward as ensuring these animals have a red-sensing cone cell in their eyes. Instead, it allows the animal to create a special oil from yellow pigments obtained through their diet, which then acts as a color filter over their retinas. Almost like a prism, the oil separates incoming light into more distinct wavelengths, allowing for very sensitive perception of shades of red. While humans are one of the few mammals that can see reds at all, our retrofit red cones really only detect a few variation in red hues. Turtles, birds and presumably dinosaurs, can make out much finer shifts in scarlet thanks to CYP2J19. The advantage this color sensitivity may have also stemmed from the same CYP2J19 gene. In addition to producing oil for better optics, the gene also helps archosaurs create red pigments in their own body. Various modern species, like zebra finches and terrapin freshwater turtles use red for sexual display, as brighter reds signal stronger health to potential mates. This may be to an association with surviving exposure to toxins, or it may be a case of just indicating that that particular animal is strong and healthy enough to survive standing out from the crowd, rather than staying hidden, almost like a lion’s mane. We don’t know how red dinosaurs may have actually been thanks to CYP2J19, but there’s certainly a chance they were showing off some bright colors. One big caveat to this concept is crocodilians. They’re also archosaurs that predate dinosaurs, but they lack the CYP2J19 gene. It’s possible that this is because at some point between the rise of CYP2J19 in a distant ancestor and now, crocodilians lived a more nocturnal lifestyle. It would then follow that, like mammals, they gave up seeing red in favor of better night vision at some point in their past. Or maybe cool streaks of red just stuck out too much when they were trying to hide in the water.